We are one of the widely acclaimed manufacturers of Centralized Gas and Chemical Handling Systems. 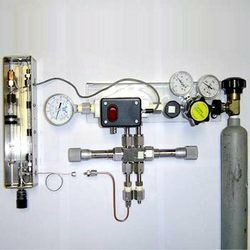 The offered centralized gas and chemical handling systems are comprehensive solution for the gas units in industries. Our offered centralized gas and chemical handling systems are core systems which can be integrated with the auxiliary systems such as conveyor systems, trolleys and stands. The offered centralized gas and chemical handling systems are available at very cost effective market rates. Looking for Centralized Gas and Chemical Handling Systems ?